“Exactly Like You.” Words by Dorothy Fields, music by Jimmy McHugh (1930). 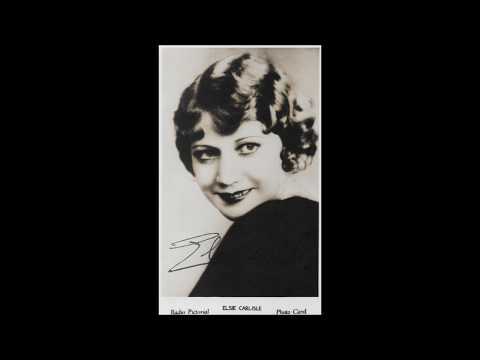 Recorded in London c. mid-August 1930 by Elsie Carlisle under the musical direction of Jay Wilbur. Imperial 2318 mx. 5448-2. On February 25, 1930, Broadway writer and producer Lew Leslie opened his International Revue at the Majestic Theatre in New York City. One would have expected a show backed by the mastermind of the wildly popular Blackbirds revues, choreographed by Busby Berkeley, and with music by Dorothy Fields and Jimmy McHugh, to be quite a success, but it had a comparatively short run of 95 performances, the last being on May 17, 1930. The lasting legacy of this well-funded flop consists of two songs: “On the Sunny Side of the Street,” introduced by Harry Richman, and “Exactly Like You,” sung in the revue by Richman and British actress Gertrude Lawrence. I want to hand the world to you. The music is extraordinarily catchy but presents the singer with quite a challenge in its range (an octave and a fifth). 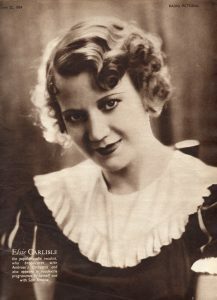 Elsie Carlisle was up to the task. A veteran of musical theater, she had, of course, introduced Cole Porter’s “What Is This Thing Called Love?” just the previous year, and it has an identical range. She works her way through the melody’s fourth intervals with dexterity, all the while giving the impression that she is on the verge of faltering. Hers was never a weak voice, but she was an actress who knew the power of the semblance of vulnerability. In the end, while the lyrics argue that we should be impressed by her lover, her overall vocal performance might lead us to admire the character that she has created, some anonymous small person who, prone to sadness, has the sudden opportunity to express great joy. I have argued elsewhere that Elsie did not simply interpret songs; she augmented them by creating comparatively advanced vocal personas that change greatly from song to song. 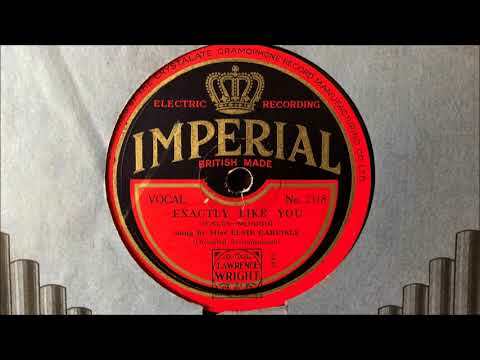 “Exactly Like You” saw many recorded versions in 1930, some of them quite commercially successful, on both sides of the Atlantic. In America, in addition to a recording by Harry Richman himself, there were versions by Roger Wolfe Kahn and His Orchestra, Merle Johnston and His Ceco Couriers, Seger Ellis, The Casa Loma Orchestra (v. Jack Richmond), Sam Lanin and His Orchestra (v. Smith Ballew), Ruth Etting, Grace Hayes, and Louis Armstrong and His Orchestra (v. Louis Armstrong). The song must have been equally popular in Britain. A London recording was made as early as January by Lou Abelardo. Jack Harris and His Orchestra did a version that was rejected by Decca. Successful issues were made by Jack Payne and His BBC Dance Orchestra (v. Jack Payne), Florence Oldham, Ambrose and His Orchestra (v. Sam Browne), The Rhythmic Eight (directed by John Firman), Bidgood’s Broadcasters (as Ted Summer’s Dance Devils, v. Patrick Waddington), Harry Hudson’s Radio Melody Boys (v. Sam Browne), Sir Robert Peel, Bart., and His Band (v. Sam Browne), and Nat Star and His Dance Orchestra (as Syd Kay’s Orchestra; v. Fred Douglas-Cavan O’Connor). London-based Americans Layton and Johnstone recorded the song as a piano duet that year.